Galway Truck Centre sell quality used commercial vehicles of all shapes and sizes. We are the experts when it comes to providing used commercial vehicles.When it comes to sourcing top quality used trucks, nobody does it better than Galway Truck Centre. Leading Commercial Garage in Connacht. We were established in 1979. We have a comprehensive knowledge of commercial vehicle operations and the needs of owners and transport managers. For us selling a vehicle is only the beginning of our relationship with the customer. We will do our utmost to ensure the vehicle fulfils the expectations of the customer. 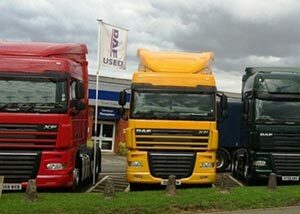 The new Euro 6 DAF product range. Completely new designs for maximum efficiency, reliability and the highest driver comfort. New state-of-the-art PACCAR engines, smart chassis layouts and attractive cabs set the standard in the industry. XF, CF, LF: tailored to suit every application. And backed by the best services for maximum uptime. Fiat Professional offer a full range of commercial vehicles to fit your business needs, starting with the Fiorino and Doblo vans, up to the more spacious Fiat Scudo and Ducato Vans. The new Canter. Efficiency in Transportation. The transport solution you choose needs to be flexible, reliable and above all else, cost effective. The new Canter is packed full of innovation. Such as the DUONIC dual-clutch transmission – a world first. The automatic start/stop function (ISS). Independent front suspension for all 3.5-ton models. And these are just a few examples. The result? Greater efficiency. Greater comfort and convenience for your daily transportation needs. And greater economy for our business.